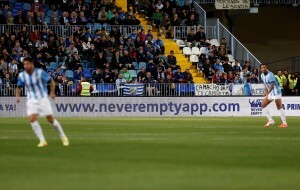 Meet Matan Ganani, an IMBA alumnus of IE Business School, class of April 2012 and co-founder of People Sports, that has developed the bid based ticket selling platform, “Never Empty” which is available online (www.neveremptyapp.com) as well as on the Apple and Google app stores. Matan has a background in Law, but was bitten by the start-up bug which he dedicates his time to now. I spent some time chatting to him to pick his brains on his entrepreneurial journey. Q: What did you think you would end up doing on completion of your International MBA at IE? If someone had told me I was going to end up running my own business, I wouldn’t have believed it at the time. I saw myself venturing into consulting and even had several interviews with some consulting firms while I was still at IE. During my third term when selecting my electives, I decided to take up Venture Lab, even though at the time I did not have any idea yet that we were going to take forward. Q: What would you say influenced your decision to start People-Sports? While bouncing off ideas with my brother on possible ventures, I started thinking a lot about the problems clubs faced especially in Spain of empty stadia. I am a very big football fan and sports in general. If you think about it, about 10 out of the 380 La Liga games are sold out, which is basically the classicos (Madrid vs Barcelona) and the local derbies in the various cities (Atletico vs Real, Real Betis vs Sevilla and so on). And the problem also affects other live events like concerts. We saw a big opportunity as this model could be replicated in other countries that had a similar problem they were dealing with e.g. France and Italy. I teamed up with my co-founder, Laurent Chabbal – Laurent has a substantial tech background in IT and telecommunications infrastructure systems – and together, we developed the idea further. He is the CTO and my partner in the company. Q: What is the one memory that sticks in your mind whenever you recall your Venture Lab experience? There are many memories I have of the experience, but the one I would say comes to mind is the Venture Day. This was probably one of the most stressful presentations I have ever given. I enjoy making presentations, but you can imagine addressing 700 plus people, and competing against other more seasoned startups. For instance one of the teams we were competing against had an app which they were presenting that already had over 1 million downloads!….tough act to follow you would say, considering our idea though solid had not had that much exposure at the time. It is one event I will always remember. Q: How would you describe your first year running People-sports after graduating from IE? It has been a journey, …a rollercoaster as most people call it, and it continues to be a rollercoaster ride. You can imagine how difficult it must have been for me and my partner, the guy from Israel and another from France, trying to convince Spanish clubs to sign up to an untested idea. Most of the big clubs were apprehensive to sign up initially as they were uncertain of the impact of the platform to their current set-up, and they were not willing to be the pilot clubs on the platform. 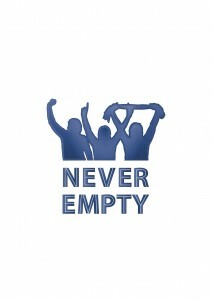 We therefore started with smaller clubs in 3rd division as we tested our idea. It took a while before we started getting some interest from some larger clubs like Malaga, Sevilla, etc. It still has its ups and downs though, very unpredictable. Lately, towards the end of the season, we’ve managed to gain some great traction, signing up major clubs as well as getting some great press. None, whatsoever! I get to make what I enjoy most, i.e. football, my work as well, and nothing beats that feeling. Q: Any big take aways from your experience you would like to share? Well, I have come to learn and appreciate that you get take-aways each and every day in this kind of work. During the process, you get a lot of advice from many people. Listen to whatever advice you get, but remember that at the end of the day, it is up to you to decide. No one knows your idea better than you. 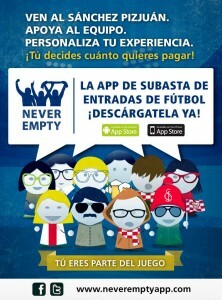 And take your time to visit the platform on www.neveremptyapp.com and download the app.